A United States Marine salutes the nation’s colors. Today, the Marine’s clear view of the Pacific Ocean, out past the San Clemente Pier, is blanketed with grey skies, but the bronze statue stands tall and proud. Embracing the overcast skies, residents, veteran and active duty servicemen and women and their families gathered at Park Semper Fi to honor America’s fallen warriors and meet one man hoping to ensure the nation, as a whole, never forgets their sacrifices. Mike Viti is no stranger to military service. A Pennsylvania native, Viti graduated from the U.S. Military Academy in 2008. Upon his West Point graduation, Viti was commissioned as a field artillery officer. He deployed to Afghanistan in 2010. For his service, Viti was awarded the nation’s fourth highest individual military award—the Bronze Star. It’s an honor bestowed on men and women who perform heroic acts while serving in combat zones. Viti completed his service in 2013 as an Army captain. Now, the 28-year-old veteran is paying his respects to the men and women who gave their lives. He’s hiking for heroes. Over the course of nine months, Viti is hiking 4,414 miles, or some 7,100 kilometers, in honor of each military member who gave their life in the Global War on Terror. Viti embarked on his journey, dubbed “Mike’s Hiking for Heroes,” on April 26 from DuPont, Washington—the halfway point between Tacoma and Olympia. Throughout May, Viti completed the Oregon leg of his trip before entering California. 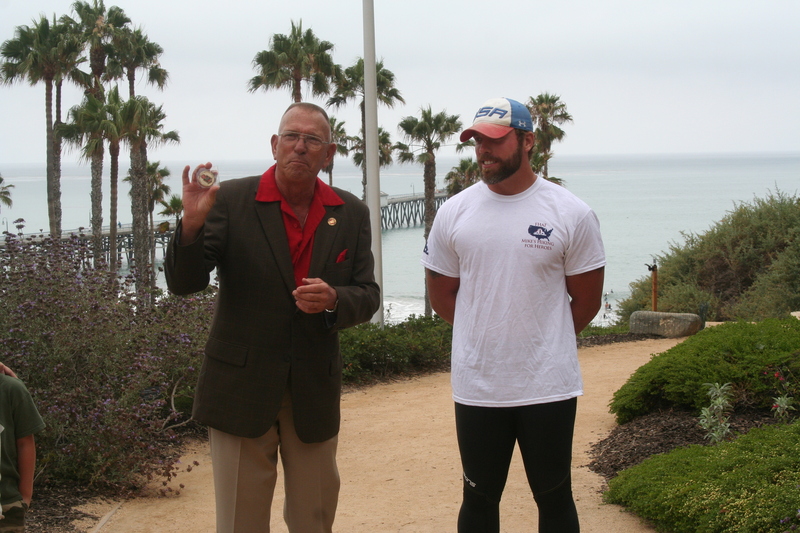 On July 2, he made his way into south Orange County, stopping at San Clemente’s memorial park before heading south. His journey, he hopes, will raise awareness of the sacrifices made by service members and funds to erect monuments in their hometowns. He’s also made meeting with and helping Gold Star family members—those who lost a family member in combat—a top priority. At each stop Viti makes, he speaks to every Gold Star family he can. And after he speaks before crowds, like he did in San Clemente, Vito asks family members to stand with him so their fallen loved one can be recognized. “That, to me, is worth every sacrifice I make for this because it’s truly meaningful,” Viti said. With the help of his team, local Gold Star families added three names to an American flag Viti is carrying across the nation. It’s a flag, filling up with handwritten names that Viti invited local boy scouts to fold. And one that he’ll carry across the nation between now and December 13, where he will end his hike at the 115th playing of the Army-Navy football game in Baltimore, Maryland. Track Viti’s cross-country journey at www.mikeshikingforheroes.com.